Hello! My name is Ben Hayes, and I'm a principal game designer in Magic R&D. I'm also the lead game designer of Rivals of Ixalan. This set was a little bit unusual to work on, relative to most other Magic sets that had ever been made before. R&D was in the midst of fundamental process changes in how we make card sets, with the old standbys of design and development being replaced by the creation of the new Vision Design, Set Design, and Play Design team model. On top of that, we were also shifting away from our large-small-large-small yearly release calendar, so Rivals of Ixalan was slated to be the final "small set" expansion. This posed a tricky question for R&D leadership. I was scheduled to lead the development team for Rivals of Ixalan. However, our new concept of a vision team didn't really make sense if you applied it to the goals of a small set looking to expand on what its predecessor established. Additionally, our old concept of a design team was something that aligned better with a small set's goals, but did we really want to go down the path of using a system we'd decided wasn't correct anymore? Ultimately, the decision was made to put me in charge of leading all the game design for Rivals of Ixalan from start to finish, and to give me an abundance of access to Magic R&D's game designers who had more experience than me in areas like leading early design. Mark Rosewater has already done a great job introducing the team in his article, so now that you've got some context, let's look at how this set came together. First off, what were we trying to make? With Rivals of Ixalan, we started from a couple of core ideas that would go on to guide most of our design work. 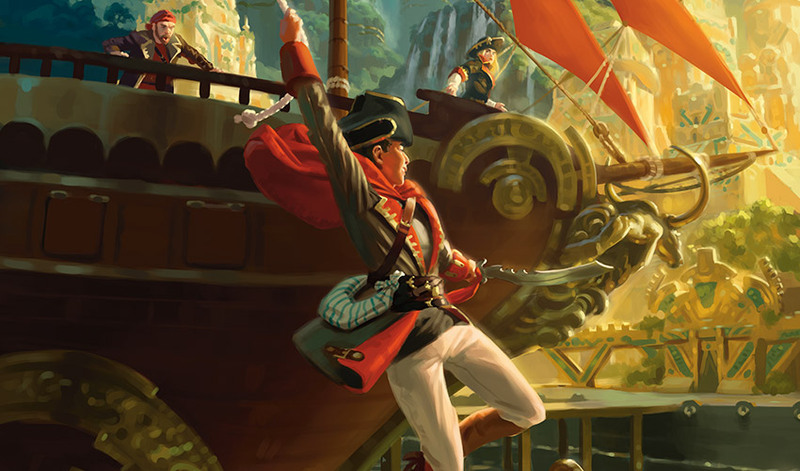 From a mechanical perspective, we knew that we were going to be adding more cards for each of the four major tribes of Ixalan, and from a creative perspective, we wanted to make players feel like they were playing through the story, building up their empire to conquer and control the city of Orazca. With the new cards we designed to add to each of the tribes, of course we needed to first look very closely at what Ixalan had done, and what we found was that in many cases it was actually more important to look at what Ixalan hadn't done. Specifically, Ixalan had aimed to have a distinct balance between tribal elements of the set and other elements of the set, such as exploration or discovery. With Rivals of Ixalan, we knew we were going to represent these tribes' last hurrah in the main Magic spotlight for now, so we decided to shift the balance more toward heavy tribal gameplay. With all that in mind, one of the very first cards we added to the set was Legion Lieutenant. While this card wouldn't have fit as well in Ixalan, with its goals of having that balance between tribal and exploration and wanting to give you more flexibility in mixing and matching, it fits perfectly in a set that wants to turn its tribal volume up to eleven. 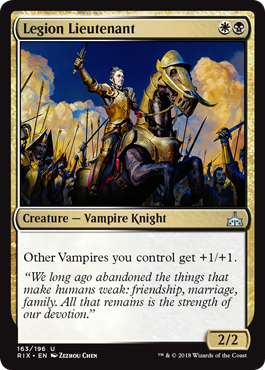 Legion Lieutenant very loudly asks you to build a deck absolutely chock-full of Vampires, and that's specifically one of the kinds of decks we're hoping to boost up here. Another place we looked for inspiration in tribal designs was Magic's past. So where would we look if we wanted to find a ton of tribal designs? Lorwyn! I love how clean and simple this cycle of cards is in what it does and what it asks of players. Do you want access to this relatively powerful card? You'll need to have a creature of the right type in your hand. How do you make sure you've got that? Fill your deck with creatures of that type. As I mentioned earlier, in addition to cool new toys for each tribe, we wanted to find a way in the set to express the central idea of conquest over Orazca. Where Ixalan was about exploration, in Rivals the tribes have found what they were looking for, and now it's time to take it! Most of the early stages of design revolved around trying to find the most fun and interesting way to get at this idea. We started very wide open, having everyone on the team come up with mechanics they thought would fit this theme. From there, we playtested a lot of those mechanics and looked to find what was working and what wasn't in a more abstract sense. For example, a lot of the mechanics we tried out early on had some element of granting extra power to one player, but only being attainable by one player at any given time, and passing back and forth, similar to the monarch in Conspiracy: Take the Crown. What we found with those types of mechanics when they're applied to one-on-one settings is that they mostly lead to very "snowbally" games where the person who gets ahead and can get the thing can use the advantage they've gotten to keep the thing and stay ahead. From there, we decided to explore the idea of players working toward getting to specific thresholds on the battlefield. Thematically, the idea is that you're building up your empire by controlling a large army and/or lots of territory, in the form of creatures and lands. We also started to incorporate the idea that this would be a thing both players could achieve in the game, and that they weren't so much fighting over control of a whole singular thing but fighting to keep each other from completing a personal conquest while furthering their own. We tried various combinations of creature and/or land threshold mechanics that made certain cards stronger when their controller had enough of that thing, but each had some big problems. If we were just counting lands, we had to keep the threshold number somewhat low in order to make it something players actually got to experience—but having that lower number took away people's feeling of accomplishment. Furthermore, we don't really give players many ways in Magic to remove each other's lands these days, so there wasn't really much counter play if you happened to be losing to this strategy except trying to win before your opponent could do it—which wasn't a terribly satisfying answer. Finally, the gameplay wasn't very dynamic and exciting, because unless your opponent had access to green mana, you could kind of just look over and roughly estimate how many turns they were from getting there and know that there likely wasn't much either of you could do to change that (short of them missing land drops). With all those issues in mind, we thought a change that could address most of them would be to go from counting just lands to counting lands and creatures. This allowed us to increase the threshold number, it gave us the permanent type that is one of the easiest to interact with (so players would have the ability to actually keep each other from getting there), and it added a wonderful level of dynamism where you could look over at your opponent, who might be three or four away from getting to the threshold, and not actually know if they might be holding just the right cards to get themselves there next turn. So, what was that fundamental problem? It turns out that creatures were actually too easy to interact with! Yup, when we were playing with cards that had abilities like "As long as you control eight or more creatures and/or lands, this gets +2/+2," we kept running into players feeling paralyzed by the idea of taking any risks because there were too many ways for them to fall back under the threshold in the blink of an eye and lose everything. The quest of building up your battlefield toward some big number and then getting rewarded for it felt great, but the execution was resulting in game states that were unacceptable. As we came to these realizations and tried to figure out where to go from there, Yoni Skolnik, a Magic R&D game designer and member of the Rivals of Ixalan team, made a suggestion that most people on the team (I think himself included) didn't really think would work. "What if it just didn't turn off once you got there?" Okay, well, how would that work? There wasn't much precedent in Magic for a threshold mechanic that didn't continually check the thing it was looking at. Threshold, delirium, hellbent, metalcraft—the list goes on, and all of them throughout Magic's history behaved in a very specific way. And yet, if it did work, wouldn't it basically solve all our problems? And wasn't that worth trying? To the surprise of most people on the team, myself maybe more than anyone, when we played with that variation of the mechanic, it actually worked wonderfully. But there were still a lot of questions. For example, what words were we going to write on these cards? As I just mentioned, there was so little precedent for anything like this, but those are stories for another time. We ended up changing what ascend counted from lands and creatures to all permanents, to give it broader synergy with other Magic sets, and we spent a lot of time working to find the most fun number for our threshold, but those were really details compared to finding that core functionality that worked to achieve exactly what we were going for. Okay, I think you've waited long enough, so here's one of my favorite cards with the ascend mechanic, Kumena's Awakening! One of the reasons I like this card so much is that it actually goes back to some of the roots of our exploration into this mechanic. In this case, both players get an advantage from this thing that just one of them has introduced to the game, which was a thing we saw players were reluctant to buy into, but that's paired with the idea that your reward for being the one to initiate it is that you can complete the "quest" and take control of it entirely for yourself. Also, who doesn't like drawing cards? While I've talked a lot about how Rivals of Ixalan had some different goals than its predecessor, we did find room for fun throwbacks to what was going on then. 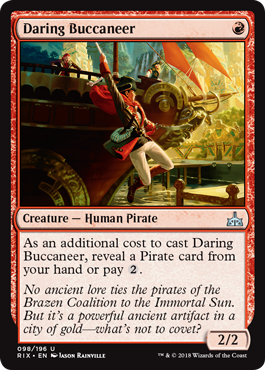 One area in particular that we found fruitful to explore was the idea of expanding on the Ixalan mechanic . . . explore! 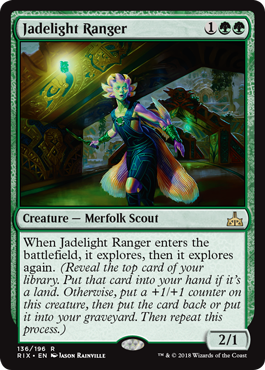 And now that I've got that terrible "joke" out of the way, I present to you Jadelight Ranger! This was one of the very earliest cards we put in the set. 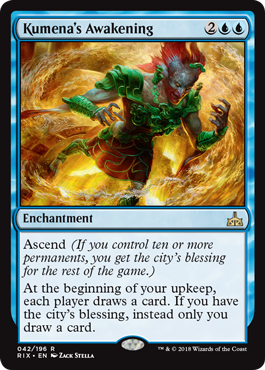 We initially tried it as a common, but it pretty quickly became clear how exciting, fun, and powerful this ability was, so we reworked it into a rare—and a Merfolk! Another solid throwback is the second Chupacabra in Magic's history. Ixalan had a lurking one; Rivals of Ixalan has a ravenous one! 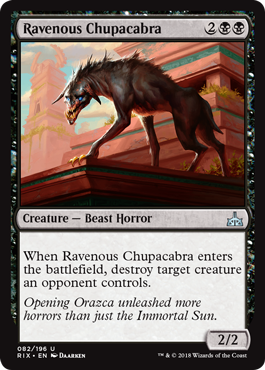 I actually like Ravenous Chupacabra for a completely different reason. I've played Magic for most of my life, and there are some iconic staple cards from throughout the game's long history that have special places in my heart. Cards like Shock, Terror, Counterspell, and Nekrataal, which have become part of the lexicon of Magic. As a designer, I appreciate finding and making the pure and simple form of our mechanics. For Terror, we eventually made Murder, but black's classic Nekrataal-style creatures never ended up getting that same treatment, so I was very excited to find room in Rivals of Ixalan to deliver on that. Anyway, thank you so much for reading this article! I hope you enjoyed this peek behind the curtain at a piece of how this whole thing came together, and I sincerely hope you enjoy playing with this set as much as I enjoyed working on it.